One morning during my daily morning scroll through Twitter I found this post. It talks about how if you use the stack I mentioned above (Typescript, React and Redux) that you would love Elm. I had looked at Elm before and although it interested me it never captured me enough to stick it out but this time I thought it might be different. 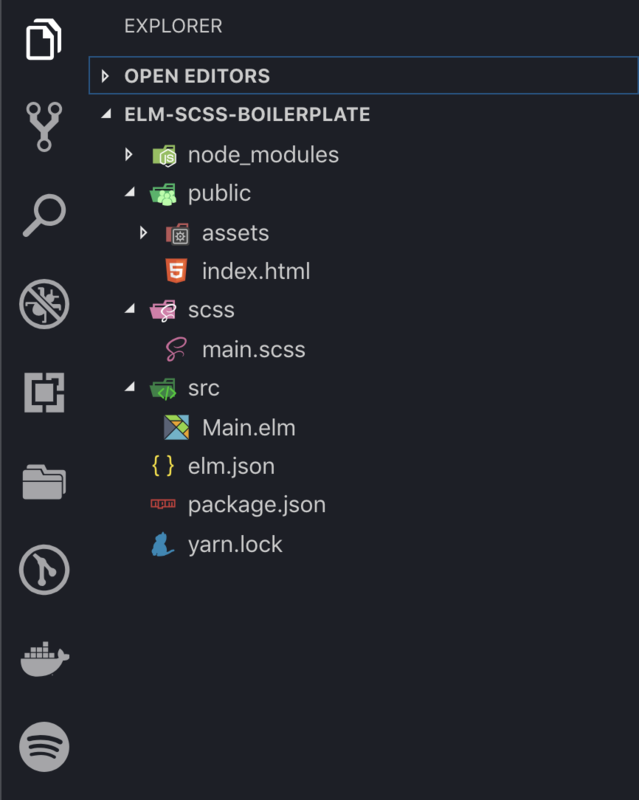 This post is not about my journey into Elm as it is still in its infancy but about how I set up a simple project with Elm, SCSS and hot-reloading. This post is not about my journey into Elm as it is still in its infancy. I am gonna run through how I set up a simple project with Elm, SCSS and hot-reloading. I realise there are lots of boilerplates out there but many of them just do too much. I want to learn in a simple understandable environment but with the perks of using something like CRA (create-react-app). I required my starter package to do a few things. I also wanted to stay away from the usual bundlers that we use in the JS world, like Webpack and Parcel. These tools are great but add a load of packages. This is obviously personal taste, and this is how I like to set things up. SCSS folder structure is also personal taste but I use this as a starting point. Most of the action happens in the package.json. We run and build our project with a number of npm scripts. "watch:elm": "chokidar './src/**/*.elm' -c 'elm make ./src/Main.elm --output ./public/js/elm.compiled.js' --initial"
While we are dealing with Elm, let's write the script to build the Elm project. This is very similar to the script above except we won't use chokidar as we are not watching for changes. We are also adding the --optimize flag so that the js output is minified and optimised. This would not be a serious modern frontend toolchain without a dev server and hot reloading. For this we are gonna use browser-sync. Let's install it. Let's add another script. This once will start a server and watch all files in our public folder. Because the other watch scripts all compile into the public folder anytime we make any changes browser-sync will detect them and restart the server and refresh the browser. "dev-server": "browser-sync start --server 'public' --files 'public/**/*. *'"
Let's tie it all together with a build and start script. For these, we want to be able to run multiple npm scripts at once. For this we will use one last package - npm-run-all. This allows you to run scripts sequentially or in parallel. With this installed we can write 2 final scripts. Let's tackle the build script. We want to be able to compile both the scss and elm in a single command. All we do is pass the names on the scripts and we want them to run in parallel so we use the -p flag. "build": "npm-run-all -p build-css build-elm "
The last script is the one we will use the most. This starts our dev server, and compiles (with file watching) both the Elm and SCSS. "start": "npm-run-all -p watch-css watch:elm dev-server"
I am still really new to Elm development and I am sure there are better ways to build your projects but I wanted something simple that I could easily understand. I hope this helps in some way.